On World Prematurity Day, Andrew Cooper, Director of Programmes, The Queen Elizabeth Diamond Jubilee Trust writes on the Trust’s work on ROP and talks about a visit seeing some of their work in India. Retinopathy of Prematurity (ROP) is a heart-breaking disease that causes blindness in babies born prematurely. It occurs when they are administered too much oxygen in the incubator, which can be highly toxic to the blood vessels, including those in the retina. Rates of the condition are increasing in middle-income countries where neonatal care is improving and therefore babies are surviving, but where knowledge of ROP and its causes are lacking. If a baby with ROP isn’t treated within the first 30 days after birth, they will permanently lose their sight and they may never even see light. At The Queen Elizabeth Diamond Jubilee Trust we’re working with the Public Health Foundation of India, the Government of India, and the London School of Hygiene & Tropical Medicine to help tackle this growing disease in India. India has the highest number of pre-term births in the world, meaning ROP is a considerable risk. Through this partnership, our goal is to increase awareness of this condition across the country, and support work to detect and treat ROP so that no more babies needlessly lose their sight. Last April, I was fortunate to visit India to see our work in action. In the western state of Maharashtra, we launched our Initiative where the state’s Government are now committed to improving ROP screening and treatment services in all district hospitals across the state. I was also able to visit H.V. Desai Eye Hospital in Pune where I saw first-hand the impact that our work is having on babies and their families. 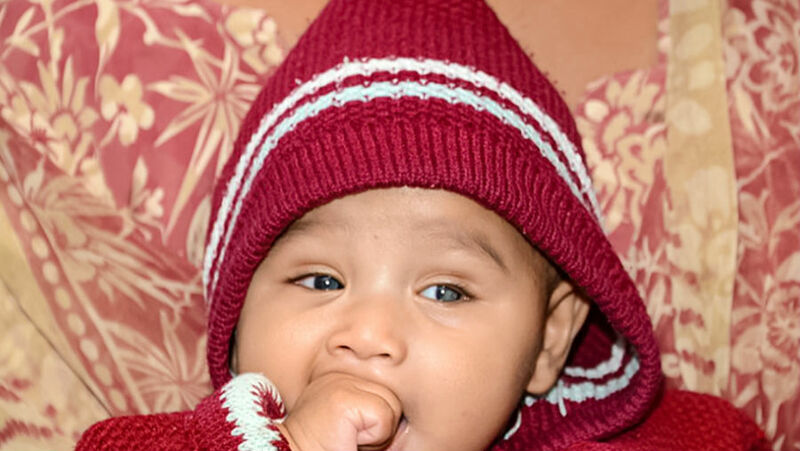 I was introduced to a little boy born prematurely whose name means “Brave” in Marathi, the local language. His parents had heard about the dangers premature babies face of going blind and travelled several hours to seek help. Despite having little money, they still managed the two-hour journey to the hospital every few months so “Brave” could receive crucial laser treatment on his eyes. I met them on their last visit to the hospital when Brave’s sight had been saved. Sadly, not every child I met was so fortunate. Sonali* was introduced to me by a member of the Hospital’s Early Intervention Team. Tragically, she was not treated in time to prevent ROP from developing, causing her to lose her vision. She will now live a life in darkness. With India having the highest number of preterm births in the world, without screening and treatment, many other children may face a similar reality as Sonali. However, work is progressing to change this. The Trust’s Initiative is working across four states in India to screen and treat babies at risk of ROP. We have also helped establish a National Retinopathy of Prematurity Taskforce, which is led by the Government of India and brings together leading experts who advice on the direction of our work and help bring about changes to policy and practice. Though there remains a lot of work to done, we and our partners are moving in the right direction to ensure that more babies like Sonali don’t go blind from ROP when it can absolutely be prevented.